Last Saturday, Bay Area Photo Club had its October field trip to the Renaissance Festival. I believe all had a great time and everyone walked away with lots of good photographs. But, then again, it would be hard not to a few good ones when you have so many interesting subjects to photograph. I used the same setup this year that I used last year—light on a stick (a Nikon SB-800 attached to monopod with a small softbox attached and triggered by my Alien Bee radio triggers). I had both my camera and flash set in manual mode, thus it was up to me to get my ambient and flash exposure correct. Steve was not there to be my VAL (Voice Activated Light) this year, but Bob and Doug filled-in for him very well. We would take turns photographing and manning the light. The whole day was a lot of fun, so I decided to start this series with a shot that might help everyone understand that you can really have a great time flying around the Renaissance Festival, especially with dad’s help. Camera settings: Nikon D3, Nikon 70-200mm f/2.8 at 70mm, shot at ISO 200, f/5.6 and 1/250th of a second with a SB-800 at 1/8th power. 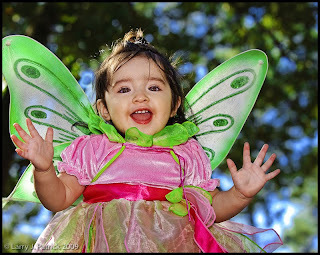 Photoshop—used nik Color Efex pro tonal contrast to bring out details in the dress and wings. Great fun action shot Patrick! Great expression. Great action. Your photographic skills were definitely outmanned by your subjects shear joy. Well done. You can see her happiness. Good job. Great shot. Sorry I missed the festivities. I cannot help but smile when I look at this one. Nice happy photo. Larry, you had a great rapport with all the small ones on Saturday as well as the older ones. I'm sure the forthcoming series of shots will prove that out. I enjoyed being your VAL for part of the day. It was definitely a learning experience and time well spent. You captures this little girl's emotions well in this shot. Color, lighting and composition are good too.